Please join us this Thursday, 5-7pm, to celebrate Marin Organic Farms and the artists who love them. Over 30 artists are featured in this show on 2 floors of the Marin County Civic Center. Organic Food from Marin Organic Farms will be featured. 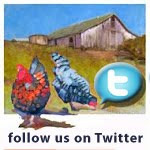 15% of the sale of art goes back to the Marin Organic, Interest-Free Farmer's Loan Fund, and 15% to Marin Arts Council. We hope you will come and see this celebration of Marin, Art and Farming. Please come purchase a piece of Marin and support our Arts and Farmers. This exhibit is ongoing through April 5, 2011.